SEGA’s annual “Make War Not Love” promotion is back for another round of community earned freebies and deep discounts on some of their more recent titles. 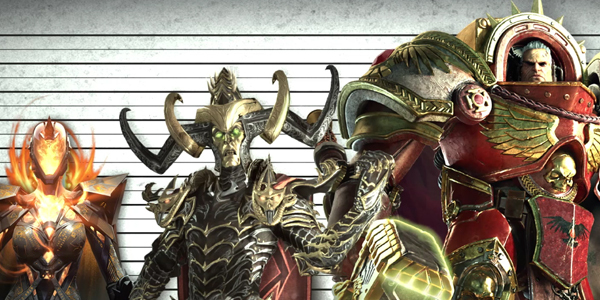 This year SEGA has chosen a motif similar to the 1995 film “The Usual Suspects”, by titling this year’s giveaway as “The Unusual Suspects” and placing characters from Dawn of War III, Company of Heroes 2, Total War: Warhammer and Endless Space 2 in a police line-up, similar to The Usual Suspect’s theatrical poster. By signing up with your Steam account and authorizing SEGA to send you promotional emails over the course of the 5 day event you’ll gain access to two classic SEGA Genesis Titles – Revenge of Shinobi and Streets of Rage 2. Each day has a community incentive to reach an unspecified total number of hours played across all titles per day to unlock an addition free game + DLC. As of the writing of this post the insentive for Feburary 14th has already been reached with a Total Warhammer II DLC and full copy of 2008’s Vikings: Battle for Asgard available. If you don’t own any of the above games to participate in the unlocking of extra freebies – it might be worth it to sign up and stick around just to see what surprises have yet to come.